We can sell this item over the phone if you prefer. Please contact us at (715) 557-1688 to purchase. International customers call 01-715-557-1688. Have an item like this to sell? Call Us! We are always looking for items like this one. If you have a similar collectible to sell, call (715) 557-1688 to learn more. International customers call 01-715-557-1688. 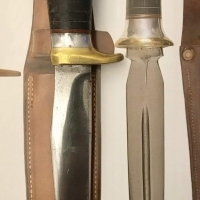 1 old 1930's-1940's small Richtig hunting knife w/Cornish sheath. This is the Richtig/Cornish combination every collector is looking for. This desirable Richtig hunting knife would make an important addition to any collection. This is a Richtig hunter variation rarely found. The handle is wood; the guard and pommel are aluminum. This knife was made by a legend in knife-making. Frank Richtig had a secret steel tempering process that allowed him to slice through railroad spikes and automobile leaf springs. Frank would demonstrate this at county fairs--after slicing a railroad spike or leaf spring, he would slice through a piece of paper with the same knife. Frank earned himself a spot in a 'Ripley's Believe It or Not' magazine in the 1930's. These knives can be used for decades, because of Frank's superior craftsmanship. This knife measures 8" overall. The blade itself measures 3 13/16". This Richtig fighter is marked on the guard 'F.J.R. CLARKSON NEB.'. The sheath is stamped 'ALFRED CORNISH OMAHA, NEB.'. This small Richtig hunting knife shows both honest signs of carry, and exceptional condition. The blade is in excellent condition. This knife has an edge like only a Richtig can have. The handle is excellent. The Cornish sheath is in beautiful condition as well. This rare variation Richtig hunting knife, with Alfred Cornish sheath, would make a one of a kind addition to any collection.